Chicago-Portland Special. Tunnel No. 2, O.R.&N. Gifford captured many images of trains, but this is one of my favorites. I at first thought it was one of the tunnels on the Washington side of the Columbia just west of Hood River, but then I read the title. We're on the Oregon side with the OR&N Company railroad. I'm pretty sure this track is just east of Mosier. The tunnel has been replaced with a big cut instead and the roadbed has been shifted considerably, but you can still see some evidence of these two old roadbeds in the satellite imagery. The endless wonder of this incomparable Journey is its sudden changes, as if the supernatural scene-shifters were kept employed in removing old scenes and bringing forward new and unexpected ones for the next act. And for a special treat, I've created an e-book version of the entire Gifford book, so you can enjoy all 18 images and text. I've been generous with the resolution so it may take a little while to download. The text is searchable, thanks to the wonders of OCR. Enjoy! Arthur, Thank you for a wonderful week of viewing our favorite places through the lens of Mr. Gifford. Thanks to the museum staff for cleaning up and rediscovering this terrific book. A standing ovation is in order. Tunnel two still exists between the big cut and the river and is walkable. In this picture the tunnel is still used but a sharp curve and trestle have been replaced. This is just west of and below Memaloose Park on I-84. What a special treat to have the Gifford book posted here. I have seen all these on postcards but not in book form, thanks again to Arthur. I think of this site, Arthur and the regular posters almost as family and look forward each week day to the new post and comments. Instead of a "Midnight Special" we have an "Arlen Special". And where did all of that rock come from for the railroad grade? Thanks for sharing Benjamin Gifford. The words in the commentary "supernatural scene shifters" brought to mind that this is in the area of the ancient Mosier Mounds. The area was "bisected by an early wagon road and the Columbia River Scenic Highway. Thomas J Connolly has written a paper about the ancient structures with some concern about preservation with the re-opening of the Historic Highway. Look at the "gandy dancers"!!!!!!!!!!!!!!!!!!!!!!!!!!!! If you go down to the river just to the west of the remaining tunnel and cut there is still shifting sand and some small dunes. A smallish reminder of what the river banks would have been like during low water conditions. I learned a new term. Gandy dancer: a track maintenance worker on a railroad. "REMARKS:Stearns Collection; OR&N passenger train, Chicago Portland Special at Tunnel No. 2, 75 miles east of Portland, Taken Dec. 18, 1897. 4-6-0 type engine No. 131. Copyright by Benj. H. Gifford, The Dalles, Or. 1901." I really enjoyed your blog this week. may have lived in the area of that barn, twenty years earlier. Arthur, is that an all Black work crew? nels, I can't see all the faces because they are wearing hats, but at least part of the work crew is African American. I suspect you're right that the crews were not integrated back then. A funny aside— No. 131 is the fictional locomotive in “Back to the Future, Part 3”. Many decades ago, in the south railroad tracks were laid by a group of men, generally black men. It was hard work and they worked closely as a team. They almost did a dance, working in cadence and singing song was they toiled. Why the name "gandy dancers" was applied, I don't know. For anyone interested there are some videos on You Tube showing how they did it. Just do a search for: You Tube - Gandy Dancers. It is almost a lost "art" form. Recently we opened a exhibit at the Oregon Rail Heritage Center funded by the Greek community that shines some light on the Greek railroad gangs that helped build the SP&S line on the Washington side of the Columbia River Gorge. The gangs were definitely not intregrated due to many factors including language, food, and methods of recruitment among other reasons. A couple of years ago we worked with the Black community and had part of the exhibit from the Oregon Historical Society that featured the involvement their railroad involvement....the video showed a Black Gandy dancer crew...quite the cadance they had to move and lay tracks. This locomotive was built in October 1889 by New York Locomotive Works, sometimes known as the Rome Locomotive Works, a 19th century builder of steam locomotives engines located in Rome, New York. The company built steam locomotives from 1882 to 1911, a total of 695. The builder number of this locomotive is 508 (UtahRails,Net). The locomotive was vacated in 1925 (this generally meant scrapping). This is a 4-6-0 wheeled locomotive, 4 wheels on the leading truck, 6 driving wheels, and zero trailing truck wheels. Thanks to Bob Slover, Friends of OR&N 197 for helping my research. Probably a dumb question, but why two tracks? Are they tearing one out? Building a new one? Is it a siding? Do they both use the tunnel? LE, the two tracks are explained in the fourth comment below the picture. I assume the date on this is in the 1910 era when major straightening was done on the entire line through the gorge. The hill between Rowena and The Dalles was eliminated (old 30 was built on the old grade), Multnomah Falls curve in 1907 ( hwy 30 again built on the old grade) and Pillars of Hercules and Bridal Veil curve straightened in 1910. 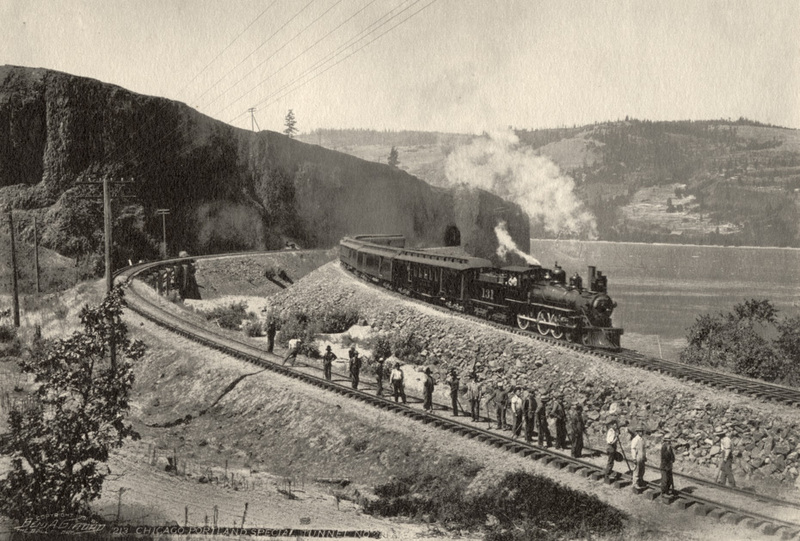 A trestle on a curve such as the original Hood River RR bridge would have been subject to severe side thrust and the drag on curves causes excess rail wear, wheel wear and wasted energy.